“What kind of selfie stick should you purchase in order to get better video? And why would we do that? 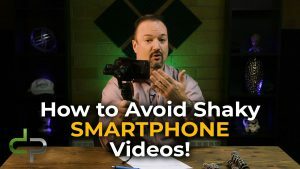 We call that the shaky cam effect where you’re doing a self-recording of a video and you are hand holding the camera which is shaking a bit. There are stabilized selfie sticks. One name brand is called the DJI Osmo. The DJI Osmo version 2 is the latest version and there are many other equipment manufacture (OEM) no-name brands of selfie sticks that you can buy again on Amazon for under a hundred dollars. The DJI costs a little bit more. The way it works is you put your phone in, you clamp it down and as soon as I power it on, you’re going to see that it’s going to level itself out. No matter what I do with the selfie stick, it’s keeping the phone level. I can go like this and it will be a very smooth video experience that it is recording of me. I can even move it with my thumb to control what direction I would like the camera to go. This enhances the video watching experience regarding a video that you quickly recorded. You should also have solid audio. I have an explanation of audio in a separate video. Another option that you can consider are little flexible tripods, mini tripods, that are easy to travel with. Maybe you don’t want to spend a $100 to $200 on a stabilized selfie stick but rather want to place down your phone at some location. This one you can see is very tiny and this other is more heavy duty. The reasoning behind that is the weight they can hold. If I put my phone on here, it might crumble because of the weight. The beauty of these is that you can wrap it around a post, a guard rail, a tree branch. You can put it on a picnic table, you can put it on a beach or a rock, you can go and put it on the table in front of you, and it is a great way so that you don’t have to carry a full-size tripod with you, but you can achieve very stable video being recorded of yourself. Remember the goal behind all of this is to avoid you handholding your phone otherwise you get the shaky cam effect. 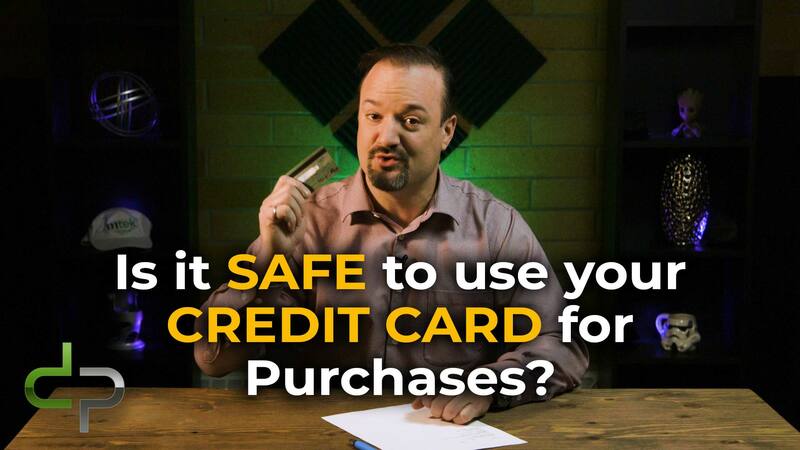 “I get asked frequently about the security and safety of using credit cards for payment. There’s physical payments, where you’re actually in person making a purchase, and then online payments. Let’s talk about physical payments. Is it safe to use tap versus putting the card in and having to type in my pin? My recommendation is anytime you have the opportunity to tap, that you tap your credit card, because no camera or person shoulder surfing, or cashier watching, or a little pin pad recorders, are all going to be not possible if you’re just tapping your credit card, and no, your pin code is not transmitted when you do a tap, it’s only the credit card number for doing the payment. You’re not giving away that confidential piece of information so that somebody could compromise. Now let’s talk about online payments. Very different. Do you use your credit card online to make a payment? My recommendation is, I avoid it at all cost if I can. Unless it’s a very trusted source and I know that I am making a very secure connection. I’m not doing this in any internet cafes, and I’m not doing it over public WiFi sitting at Starbucks, Second Cup, or Tim Hortons, or some other coffee shop. What I’m doing is making sure that I am using a VPN connection. It’s a secured encrypted tunnel. I have a video on that if you want to go and look at my recommendations on VPN providers that you should use for virtual private networks. I’m also making sure that there’s that little lock symbol on my web browser. It says https and it says secure, to make sure that the information between my web browser and the web server at the other end is encrypted, and if I have a choice, I am not putting in my credit card number into that form. What am I doing? I’m using some kind of tokenized payment system, like PayPal. That’s why I like PayPal because PayPal has the ability to do a one-time authorization of a payment to a vendor. They don’t get your credit card information. They cannot go and charge it again for other charges, unless of course, the vendor that you went and subscribed to has you doing a recurring payment by PayPal, and that’ll be very obvious to you. It’ll come up on the screen, and it’ll say, “Are you sure that you want to authorize a recurring payment for the current payment and future payments?” No, you want to make sure that you’re doing a one-time payment. If by chance you did a recurring payment on PayPal, you can go into your settings of your PayPal account, review all of the recurring payment merchants that have access to your account, and you can disable them. I do that very frequently. Probably once every month or two. I review everything on there, and I disable anything that is set for authorized access to my account, because, I want to make sure that I know and have control when I give out money from my account and make online payments. Another idea to use gift cards, to use anything online where you’re not giving out your information of your card. That’s what bothers me is that credit cards are too easy to use and share. Once you know the credit card number, and you know the expiry date, generally speaking that’s enough, in a lot of cases, to go and make online purchases. 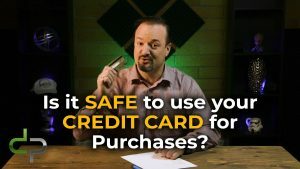 The black market for credit card numbers is quite prevalent, and you want to make sure that you have enabled credit card alerts on your credit card as well, so that any time a charge goes through from your credit card that you get notified right away by email or text notification. Most credit cards allow this ability. I have enabled it on all my credit cards, and it tells me immediately. I could be sitting at a cashier right, and using my credit card and immediately I get an alert. It’s very quick. The reasoning that it’s good is because if something bad has happened, then you can immediately shut it down or call your credit card company and say that’s an unauthorized charge. Another tip, use a second credit card for your online purchases. If you actually need to use a credit card, and you can’t tap it, and you can’t go and use something like PayPal or some other token based payment system, I would recommend that you have a second credit card with a low limit. The purpose behind that is if that credit card gets compromised, they can’t do much with it. It has a low limit. 500 or 1,000 dollars. Also, if you cancel that card, because it got compromised and you need to get another one, it doesn’t matter. It’s not going to affect you going and contacting all of your accounts that have preauthorized purchases. Also perhaps you’re traveling. When you travel and you need to use a credit card for payment, which I would be very careful with when you’re in a country that is unknown to you, again, you could use your second online credit card for those purchases that are questionable because, again, if it gets compromised, it’s not your main credit card that has all your preauthorized payments associated with it. 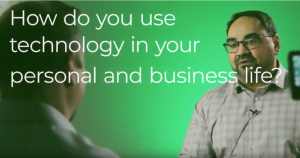 Lak provides his thoughts on recruiting solutions and the tools that make his work and life better, as well as some of the things that he looks forward to one day! “One question I get asked frequently is about audio. We’ve all heard that the built-in microphones on most phones don’t quite sound as dialed in as they should be. 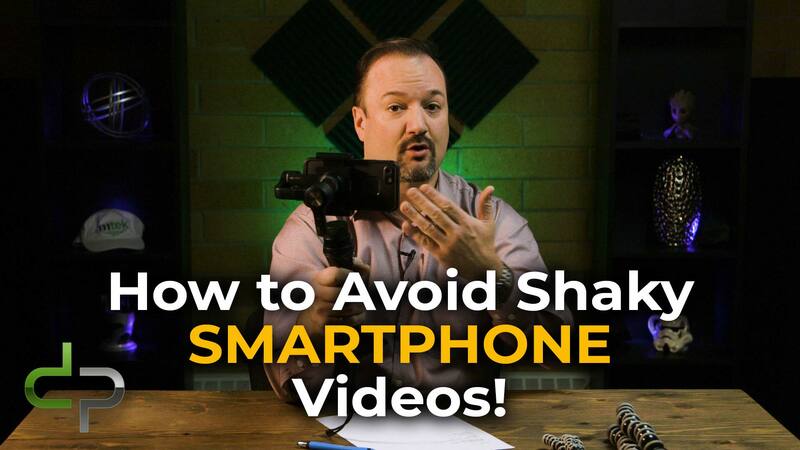 The video is quite great on a lot of smartphones, for quality. But on that note, it is very confusing in order to figure out what kind of microphone you should be purchasing. I think for most people going on Amazon and purchasing a wired lav mic is the best way to go. I’m wearing one right now and that’s how I’m recording this. We have different options. Here at the very cheapest is a $3 one that I picked up. Just clips right on and it’s got an end here. Now, here’s the gotcha. I’m going show you two different wired lav mics. But they both actually appear to have a similar connector. It’s called a 3.5mm connector. But they’re actually different. And what you’ll observe is that this one only has two black lines on it, this one has three. We call this a TRS connector and this one is called a TRRS connector. The difference between that and if you wanna get into the technical acronyms, it’s tip, ring, ring and sleeve. There is a difference between TRS and TRRS. And the reason is, when you go to plug it into your phone, if your phone has the ability to connect something in, Apple has gotten rid of the headphone jack as a lot of people have known. And now it’s lightning connector only. If you’re on an Android, possibly it will still work. But if you’re an iPhone user you need another adapter. A lot if the iPhones that you purchase now will have this little cable that you use to go to traditional headphones out. Lightning on one end, and one on the other end. What it is expecting for a microphone jack to work is a TRRS. A tip, ring, ring, sleeve. It’s got three black lines on it and then you would plug that in, that would go into your phone and then you would be able to talk to it. If you don’t have that, believe it or not, there are adapter cables that you can purchase called a TRS to TRRS adapter or vice versa. That is what I would recommend you pick-up for better audio quality on anything that you do for video. Go and pick up a cheap wired lavaliere but to be aware that if you plug it in and it doesn’t work, you might need an adapter.